2011 was an emotional roller coaster for investors and marked the return of heightened market volatility. Bad news and black headlines created fast moving up and down markets and yet by year-end prices for the S&P 500 ended nearly unchanged. The wild price swings included a 29% drop for the average stock between April and October. Most of the stomach-churning decline took place in just 13 trading days in August. As we pointed out in last quarter’s newsletter written during the worst of the stock market decline and at the peak of investor fear and pessimism; “Any positive news can quickly move investors away from their worst fears toward a little more optimism and carry the rally further.” Indeed, that rally has taken place and today your portfolio value is within a few percent (adjusting for withdrawals) of another all-time high. Why so much volatility? The first half of the year began with promise of continued economic strength but by summer the positive attitudes made a complete reversal to outright fear. Reasons for the mid-year change in investor confidence stemmed from several events and a nagging unresolved long term problem. Spring flooding in the mid-west added with the Japanese earthquake, devastating tsunami and ensuing nuclear meltdown slowed global and U.S. economic growth. In addition, U.S. politicians bickering over raising the debt ceiling (once again) resulted in a downgrade of U.S. debt for the first time in history. Not to be outdone, European politicians struggled for a solution to their own sovereign debt issues (namely Greece, Italy, Spain, Portugal, and Ireland). Fears of global contagion emanating from Europe added another layer of uncertainty to our own debt issues in the U.S. and exacerbated financial market volatility. The common thread and root cause of problems in the U.S. and Europe revolve around excessive levels of government debt, a fiscal course that is clearly unsustainable. The Greeks are providing a painful example of how excessive borrowing to meet irresponsible spending habits ultimately leads to disastrous outcomes. Is anybody in Washington D.C. paying attention? Entering 2012, investors will be buffeted by both positive and negative crosscurrents. Headwinds include a still delicate U.S. economic recovery with persistently high unemployment. A near certain European recession will be an additional drag on U.S. growth in the first half of the year. Election year political infighting guarantees gridlock and little hope of long-term budget solutions. There will be other unforeseen challenges, but there are also silver linings in the clouds. On a more optimistic and encouraging note, behind the headlines there is steady improvement for the fragile U.S. economy. Since the 2008 financial crisis it is abundantly clear debt is once again a four letter word. The world has turned its back on debt accumulation and is earnestly paying down borrowed money—a term called deleveraging. U. S. households have taken the message to heart and begun the long process of reducing debt, saving more and returned to living within their means. Steady progress has been made over the last few years and families are on the path to re-establishing lower debt to income levels. Corporations, with vivid memories of the depth of the recent “Great Recession” have taken strong measures and continue to fortify their balance sheets with even more vigor than the consumer. Corporate cash levels have recently reached high levels not seen in decades, demonstrating businesses are financially fit and well prepared for whatever comes their way. Even bankers have taken action, tightening lending standards, reducing costs, writing off bad loans, and furiously re-building capital structure. After four years of restructuring U.S. bank balance sheets are substantially repaired and in much stronger shape. These are all good signs and sensible responses to the banking crisis and severe liquidity crunch of 2008. In fact banks are poised, after passing stringent government stress tests, to begin raising dividends again for the first time in years. 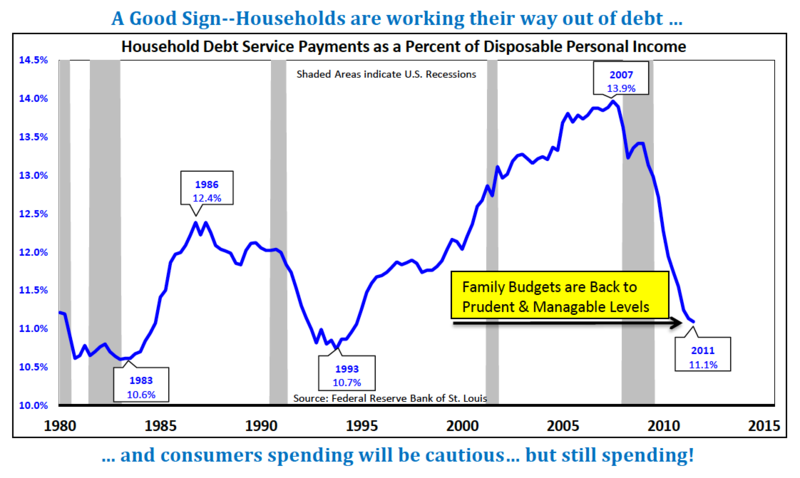 The “debt deleveraging” process for all these players, although painful these past few years, has now put them on a fiscally prudent path where they are able to contribute to a healthy and sustainable recovery. One especially significant economic engine missing the past five years is the housing industry. Homebuilding activity is finally showing signs of life, inventories are clearing, foreclosures are declining, and sales and starts are beginning to lift from a very low level. New household formations and generational low mortgage rates give promise the housing industry has seen the worst and moving forward in time will no longer be a weighty drag on the economy. In fact, the industry could modestly contribute to economic growth for the first time since 2006. Importantly, the negative wealth effect from the vicious declines in homeowner equity is bottoming. Consumer attitudes will improve with a positive wealth effect from home price improvement. Improving consumer confidence is a key building block for new home sales, higher spending and a stronger economy in 2012 and beyond. The question is how will all these economic crosscurrents affect the financial markets? Notwithstanding lingering uncertainty from Europe’s debt problems, ultimately the U.S. markets are viewed as a safe haven and stand to benefit from Europe’s troubles. Our strategy is to continue to follow our business cycle disciplines, pay careful attention to intermediate opportunities (2-6 month moves), and take a flexible approach to portfolio decision-making. Pring Turner’s keystone focus on Quality, Value and Income is essential to generating positive total returns (both income and growth) throughout the cycle. The economy is operating at a frustratingly sluggish pace and moving along a relatively anemic growth path. Due to the continuing debt-deleveraging process referenced earlier, the amplitude of economic ups and downs will remain muted and business cycle swings more compressed. Corporations have little likelihood of mass layoffs that could dramatically undermine the economy. Firms are already lean having slimmed down budgets, inventories and employment. Equally, the Federal Reserve stands prepared to inject additional stimulus (Quantitative Easing III?) should it be needed to re-invigorate the economy. We have termed this new economic environment as “squishy,” where the cycle flattens out and both expansions and contractions are more subdued than normal. This backdrop plays well into Pring Turner Capital Groups’ long-term strengths, especially our focus generating stable income from bonds and stocks in portfolios. For now, we continue our attention of searching out solid, high quality investments generating above average income to bolster returns. Pring Turner’s mission is to protect and grow your valuable assets. Some years our mission is easily achieved, others are more difficult. 2011 was certainly challenging for us. Our overriding goal for 2012 is to set new benchmark highs in your wealth (adjusting for distributions). We are proud to report accomplishing this goal in 10 of the last very difficult 12 years. You are starting out the New Year very close to new portfolio valuation highs and we are working hard to ensure your success. We appreciate your continued confidence and wish you all a Happy, Healthy and Prosperous 2012!